The bookstores are swarming with “general history of piracy” books. There are quite literally dozens of them. Styles range from large-scale textbooks with lots of graphs and pictures to text-based novels to numerous children’s books. Yes, the shelves are swarming with pirate history books. 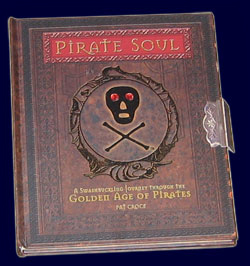 So why should Pat Croce’s new book, Pirate Soul, be anything special? Simply put, it isn’t a book – it’s a pirate activity center tucked between two covers. Most every page of Pirate Soul contains one or more goodies – folded up maps of Charles Town and Madagascar, ship’s articles, and royal proclimations. Without leaving your home, you can feel the pirate gunpowder and play with the coils of a cat’o’nine tales. Some of these goodies seem a little odd (why we need an outdated list of taverns in Port Royal is beyond me) but most should prove exciting little discoveries for parents and kids alike. This book is so packed, in fact, that most every page could become a bedtime activity to do with the wee ones – read through the material, and then explore the treasures. What shall be discovered tonight? Perhaps a Letter of Marque, or maybe Captain Kidd’s long lost French passes? This book is well tought out, and well crafted. The artwork is beautiful and fun, and the various goodies should keep everyone busy for a sizeable sea voyage. The end product does have a few slight shortcomings – a feather quill that doesn’t come out (in a book like this, I found myself nearly yanking the page in half), only two period playing cards (the book’s description claims it contains “period playing cards”, which may mislead one to expect an entire deck) and an inserted compass in the inside back cover that is only for show, rather than functional. But in most all other respects, this book is a true gem. Completing it all is a pirate flag tucked into the back cover (approx 20′ x 20′). The material appears to be cotton, rather than the more common polyester, although the silk-screened Jolly Roger only appears on one side. Both would have been nice, but being as most young pirates will likely stick it on the wall (rather than hoist it up a mast), it probably makes no real difference. A fun-filled book, and highly recommended. This entry was posted in Books and tagged activity, children, croce, non-fiction by Bilgemunky. Bookmark the permalink.